Neurofeedback is a brain exercise, like taking your brain to the gym. Your brain made up of millions of neurons that are constantly firing. This firing produces electrical signals. 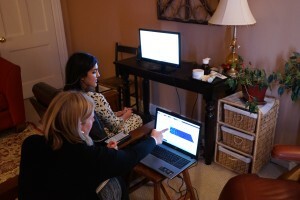 As Monica Hammock, LICSW, describes, neurofeedback uses those signals to help us determine which of our firing patterns are “efficient,” or healthy, versus “inefficient,” or unhealthy. When the equipment recognizes that the brain is producing healthy patterns, it rewards the brain via the sensory feedback. As a result of this positive reinforcement, your brain learns to repeat those healthy patterns over and over, thereby teaching itself to function in a healthier manner. Neurofeedback is most successful when the problem is one of dysregulation–the brain going too fast, too slow, or not working well within. It was first created to treat seizures, a condition in which the entire brain is firing in too rapid and synchronized a manner. Neurofeedback is helpful in reducing anxiety, negative reactivity, impulsivity, and the compulsive behaviors of addictions. It is also a wonderful tool for mood regulation, improving focus, and peak performance training, and is frequently used by individuals to manage and treat ADHD, eating disorders, sleep problems, and more. There are a wide range of research on neurofeedback’s efficacy. This page organizes the research by topic, so you can learn more about what has been studied so far. Initially you will meet with a clinician for a thorough assessment. Afterword, assuming that neurofeedback appears to be a promising fit, you will try a few sessions to see if you find it helpful. A neurofeedback session begins with the clinician placing electrodes on your scalp, after which you’ll focus on a screen that delivers sensory feedback in response to your brain activity. Neurofeedback is quite different from talk therapy and we find it to be an uniquely helpful addition. It makes sense that someone would have a lot of questions before starting. We encourage you to come in for a free consultation to see the equipment and ask questions. Also, you can check out eeginfo’s website to explore a bit more!